So please join me now in welcoming Steven! SLH: Steven, thank you so much for taking the time to join us today! Let’s jump right in, shall we? When did you first become interested in writing and/or illustrating? SJP: I’ve done both for as long as I can remember…bet you never heard that before. I always drew more than I wrote but ideas were always floating around in my mind for new stories. I used to read comic books on my stoop in Brooklyn and then go to my room and copy the pictures. SJP: My dad is really a wonderful artist. He made his career in advertising as an art director and studio manager. He used to bring work home with him to retouch the old-fashioned way, with an airbrush. I remember spending time at his side while he painted away and I was amazed at the results. 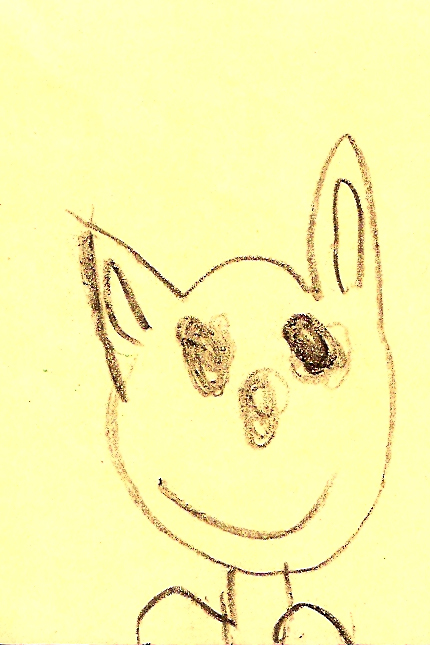 A drawing Steven did at about age 5… a natural talent! SLH: You are both an author and an illustrator, so which comes first for you, the story or the art? SJP: I’m more of an illustrator, that’s the part I really love, so I always see a character first and imagine what he or she might do after that. I know all about characters whether I create them or not, before I draw or paint them. I imagine what they’re like outside of the story. It makes it easier for me to imagine what they are doing or what they might do. SLH: Is there an author/illustrator who has been especially inspirational or instrumental in your own development as a writer/illustrator? SJP: Well. I learned art from my dad. I had no art classes in grade school or high school but my dad would show me how to draw things and I’d observe him at work. My parents made sure I had pencil, ink and paper and all the art books I wanted. My dad arranged for me to meet Burne Hogarth who wound up writing a letter of recommendation for me to attend The school of Visual Arts in NYC. I’m a throwback to a time when illustration was not far removed from fine art. The technical quality of my work is really important to me, the basics, you know… good composition, creative use of color and value and so on. N.C. Wyeth is my biggest influence in illustration because of his own story and because of what he was able to do with the printed page. I maintain a written dialogue with his grandson, Jamie Wyeth, who has mentioned how much he likes my work. Recently he wrote to tell me that he was working on a huge painting of a shark jawbone and he has my original cover painting for “SHARKS!” hanging right next to it in his studio! 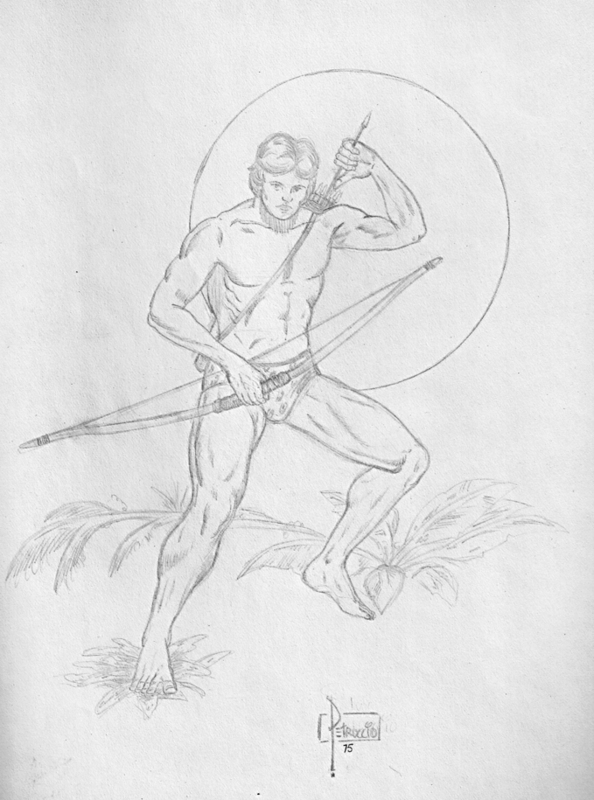 A drawing of Tarzan Steven did at age 14. He had no art education, so he learned from comic books. 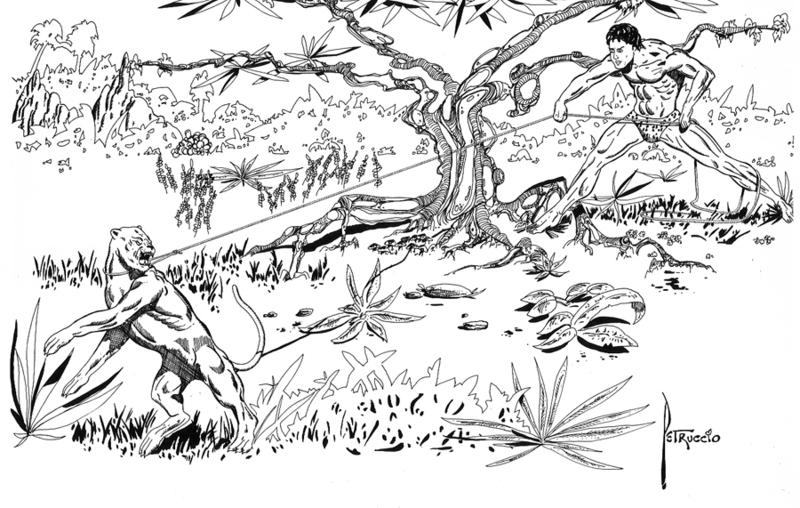 An ink drawing of Tarzan Steven did at age 16. SJP: Understand that being an artist was not seen as a practical career choice and I was encouraged to seek advertising work because my older brother, who always drew and painted as well, followed that path. My goal was to make a living drawing and painting everyday. As an illustrator just staring out, you take whatever comes along. I started getting magazine work even before I graduated from SVA and did mostly editorial work for three years. I was then asked to illustrate some books that another illustrator had backed out on but I had to alter my style a bit to do so. I needed the money so I took the job. 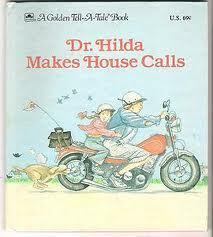 The first time I really got to use my own ideas was in a Little Golden Book titled “ Dr. Hilda Makes House Calls”. It was a fun book to do, I got to create my own characters in my own environment and I totally enjoyed it. Seeing it in print was very satisfying. 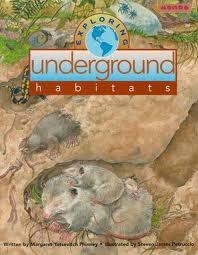 SJP: Well, as the illustrator, the story generates the ideas for the characters and settings. I always try to put my own twist on things stylistically and compositionally. As an author my ideas come from my own experience. I may see a person and they remind me of something or generate a potential character or I may see a place and something there inspires a story…it just happens. The coloring/activity books I’ve written and illustrated for Dover Publishing ( American Legends and Tall Tales, History of the White House, History of the Civil Rights Movement in America and Roadside Attractions) were ideas my editors and I developed to make them as interesting and informative as possible. SJP: If you’re familiar with my natural science illustrations you’ll notice how detailed my illustrations are. That’s not by accident or pure imagination. I research every detail for every blade of grass or seaweed that I paint. For my book, “Exploring Underground Habitats” I had to wait two months for a scientist to return from a research trip so I could get accurate reference for a particular cave spider! Researching is always a challenge but well worth the effort. SJP: Okay, so I wake up every morning and get to do what I’ve always wanted to do, what I love to do. Now that’s wonderful! SJP: I’ve been doing school, library and museum visits for the past twenty years. Now, understand that I was very shy as I was growing up. I also sing and play guitar and when I was younger my parents would ask me to play for relatives ,so I would go into another room, close the door and then play and sing. Needless to say, I overcame that shyness. When you really know about what you do it’s easy to talk about it and teach others about it. I went to see some authors and performers who visited my kids’ classes when they were in elementary school and was later asked by their teachers to come and talk to the class about what I do. I actually liked it! I saw what kids were interested in, what they wanted to see and hear and what the teachers expected from me. I also make sure that my programs meet art-in-ed learning standards so it’s not just fun…it’s funducational! I have a general program which I can alter depending on the age group and two workshops to give practical experience and develop an appreciation of the creative process. I give teachers follow-up materials so they can continue learning about picture books and illustration. SJP: I’m currently advising three young artists who want to become illustrators. They approached me and that shows me their passion and desire to be creative. I do teach at Marist College in the Studio Arts Department as an adjunct one night a week because I want to teach young artists the practical things they need to succeed. I tell theses young illustrators and art students the ups and downs of the industry. It’s hard work, long hours, shorter and shorter deadlines, constant marketing, negoiating and continuing to grow as an artist. I tell them all to be persistent! Any creative field is difficult, know that starting out, be prepared for rejection…and more rejection, believe in your work and keep producing new work. Don’t give up! SJP: Right now I’m working on a new book about American Heroes also, a big educational illustration project and sending out dummies of my own stories as well as developing new stories and dummies. SJP: I don’t know everything and I love learning new things and hearing the stories of other creative people. I attend conferences when I’m asked to be on a panel or do a book signing only because I’m usually busy working on a project. It always seems that conferences that I’d love to attend ,just to see and hear other people, are always around times of deadline crunches or painting projects. ( I also paint for exhibition regionally and nationally.) As for contests, most of the books I illustrate are not eligible for competitions because they are part of a series. I’ve never been one for competitions anyway. I do enter my fine art work in juried exhibits though, to gain exposure for that part of what I do. SJP: Ah, sales figures…see, this is a business. We do have to be mindful of how our “product” is received by the public and sales is the way to do that. 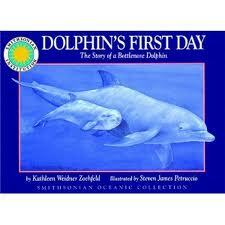 So far, my best selling book has been “ Dolphin’s First Day”, (Soundprints Publishing). It has been in print for years and released in many countries. The Smithsonian series has really been good for me in terms of sales but I put so much into those books that it’s gratifying to have them appreciated by young readers, parents and critics alike. Most of my titles for Soundprints are still available. SJP: Well, I have an illustration agent, Storybook Arts, Inc. and I’ve had an agent for a long time. We market through our own website and a variety of other sites as well. I maintain my own site and blog when I can as well as Face book , Twitter , ( although I’m terrible at updating) LinkedIn, Behanace and SVA Alumni Portfolio. I try to maintain personal contact with Art Directors and Editors I’ve worked with. By the way, many people do not have agents, it’s a personal choice depending on how you want to conduct your business. So don’t let the fact that you don’t have an agent deter you from pursuing your goals. SLH: Reader question: how important is it to have a story? Can you just entertain and make people think, or do you have to have a story to make a picture book? SJP: Well, really the most important thing is the story. Whether it’s told in words, pictures or words and pictures. If the story is terrible who will want to read the book. I don’t want to read stories that are uninteresting or not entertaining in some way so I don’t expect my readers to settle for less. I tend to illustrate stories that I feel I can bring something to visually. My own stories have to be interesting to me and not just something I think someone else will find interesting. I think I’m my worst/best critic. Stories can be JUST entertaining or JUST thought provoking or… C) All of the above. Left or right handed? Righty! Agented or not? Illustration agent. Traditionally or self-published? Good ol’ fashioned, traditional publishing. Hard copy or digital? My book “SHARKS!” will be available digitally…otherwise I’m a hard copy guy. Apps or not? Let’s say…not yet. Plotter or pantser? Plot, plot, plot. Laptop or desktop? Both…as well as iPod and iPad. Oh, and remember those things called ‘pen” and “paper“? I still use them! Mac or PC? Both for writing/business. Mac for art. Day or night worker? Whatever the client needs me to be in order to meet a deadline. I’m an early riser anyway. Coffee or tea? Coffee…unless you can find the blueberry tea that Starbucks discontinued. Snack or not? Oh yea…you gotta snack! Make sure you exercise each day though, get up from that desk or chair and move around. Salty or sweet? Uh, is pizza an option? Quiet or music? Music…jazz, some classical, indie rock or golden oldies. I used to play and sing in a club to afford my art equipment so I covered many genres of music. Cat or dog? Used to have a cat…now a fish! Forging a living out of something you have a gift or talent for is a great thing. It’s hard to do it alone and I have my wife, KathyAnn, to thank for her support from the very start. In good times and in bad as they say, she has encouraged everything I do and has been my biggest fan. Her own artistic background, having worked in NYC as a graphic designer for CBS Television and DC Comics, and sense of design and style have been invaluable to me. My kids provide support as well while nurturing their own creative side. My daughter is a wonderful dancer and singer and my son a budding young photographer/videographer and internet entrepreneur. Surrounding yourself with people who support you, encourage you and inspire you is crucial to your success. Tolerate those who say you can’t because they can’t and be encouraged by those you see doing what you want to do everyday. People have been writing and illustrating for ever and ever…why not you? Thank you so very much for going us today, Steven, it was a real treat! And now! Anyone who would like a chance to win the signed hardcover copy of Puffer’s Surprise, please leave a comment below. Tell us what you most enjoyed about the interview, or if you have a question for Steven ask away!, or just tell us who you’d like the book for! Great interview! I was happy to learn more about Steve- who truly is a nice person and wonderful artist. What a lovely, encouraging note at the end! Wonderful interview, Steven & Susanna! Your Tarzan drawings before art instruction are amazing! These books look great; I've heard of Soundprints. So glad you enjoyed it, Tina! And really, you should see the detail of the art – it's amazing! Such meticulous research. Everything has to be approved by Smithsonian! I've always been amazed at the ability to take a picture, then recreate it down to the very last wrinkle or quirky detail so the drawing appears just as real as the real thing. Awe-inspiring. I know, Angela, me too! I cannot draw at all, so I'm especially impressed. Steven's art is really amazing! But it seems to me the encouragement you have had in your writing life has spurred you forward. I have that too. From family and from the giver of this interview. She's truly bodaciously amazing. I'll be visiting you over at your place, Steven. Lovely to meet you. I gotta get your books. Thanks y'all! I have a question for Mr. Petruccio. What advice do you give to young kids who want to write and/or illustrate? I really like the interview! What a fun interview! I love how detailed Steven gets with his research (waiting two months to hear back from a scientist??? That's dedication!) and illustrations. Thanks to both of you for a great post! I loved Steven's drawing from age 5 and the fact that it was included in this interview… reminding us that we all have to start somewhere! I'd love to win the book to read to my son AJ. I loved hearing about your successes, Steven. Your art is beautiful and amazing. Great interview! As Steven says, its nice to be able to wake up and do something you love! And I'm impressed by the amount of research he does to create an accurate illustration of whatever he's working on. A sign of a great illustrator. So glad you enjoyed the interview, Robyn. Steven is amazing – very talented and very inspiring! So glad you enjoyed it, Erik! I hope Steven will get a chance to stop by and answer your question! Glad you enjoyed it, Jess. And I think his attention to detail is one of the things that makes his art so amazing! So true, Romelle! – both the illustration research and the recognition of how wonderful it is to wake up and get to do something you love! What a great interview, Susanna and Steven! I especially enjoyed hearing about Steven's school visits. Can't wait to follow the links to see more of his work. Loved the interview. Good questions and good answers. Thanks Steve for giving a positive push to new illustrators. You're talent and detail shines through your illustrations. So glad you enjoyed it Brenda! Steven is so talented! We do own “Dolphin's First Day” and it is lushly cool and beautifully depicts the dolphins! Nice to learn more about this talented illustrator. “Puffer's Surprise” sounds cute. The kids' dentist has a fishtank with a puffer, but we have never seen him self-inflate! I love to do research for my animal (and other) books–probably way too much. It was intriguing to read about how much research Steven does to get those fabulously accurate details in his natural science illustrations. The research certainly pays off–his artwork is amazing (I'm “lucky” I can draw stick figures)! As I've mentioned elsewhere, I really cannot draw, so I am awed by Steven's ability! I have never seen a puffer inflate either, but I bet it's something! Thanks, Susanna, for the pitch plug…yup…it will be me and a picture book hopeful on Wednesday. 😉 Let me know if you can't find the info! Thanks, Susanna and Steven, for the great interview. I read a lot of author interviews in which they talk about how they got their start. It's nice to hear from illustrators too. Pizza is always an option. This would be an ideal book to share with my grands. Steven, Thank you for the encouraging and informative interview! I love that you do research to make sure your illustrations are accurate. My husband also taught himself to draw by studying and copying comic books. I appreciate your level of committment and the fact that you still consider yourself a student of sorts. This was a great interview. I learned a lot. I'd like a copy of your book and find the perfect music to accompany it and share with the early learners in my music & literacy program. I think it would be fun showing them the level of detail in your illustrations. Best to you. Research is an aspect of illustration that I think a lot of people (who aren't illustrators :)) don't really think about… Pretty much any book might require research into something I would think! I think your kids would love it, Pam! Hi Susanna. Thanks so much for the opportunity to share a bit about me and what I do with your audience. Speaking of your audience…Thank You all for taking time to read and comment on the interview. Someone asked for a bit of advice for young people who want to become illustrators so here it is…DRAW, DRAW, DRAW and when you're done, DRAW some more. ( Young authors replace DRAW with WRITE). Nothing is more important than practicing your craft even before you get technical training. Your creative work should be what you want it to be so become comfortable with the way you draw or paint (or write). Remember, if you're not satisfied you can always get training to learn more or new techniques but don't give up just because your work is not like everyone else's. Oh yea, have fun! Wow, was I thrilled to read your interview with Steven. I was an adult student at Marist College (as well as working in the Office of Human Resources) when I took Steven's class “Fundamentals of Art and Design” back in the Spring semester of 1996. I was going for my Integrative Major degree and was still nervous about taking classes as a new adult student. Steven was fantastic! He put me completely at ease and restored my confidence in my ability to complete the course (and pass with flying colors LOL). Due to Steven's influence, I decided to continue with art courses and graduated with Art as one of my majors. Thank you Steven, for a wonderful experience. By the way, you autographed a book for my grandson when he was 2 years old. He is now 16. How time flies. I just retired from Marist on May 31, 2012 after 26 years and am enjoying every minute. Enjoy the rest of your summer and hope to meet you again soon. Take care. What a wonderful story, Patricia! Thank you so much for taking the time to stop by and share it! Steven really is great, isn't he? One of the first times I met him was at a conference where I had to be on a panel. I'm accustomed to doing presentations with children, but adults scare the bejeesus out of me 🙂 I was SO nervous!!! But Steven was sitting in the front row, and he was so nice – I just pretended I was talking to him and the whole thing went fine! (Of course, afterwords I couldn't remember a single word I said, but apparently I got through it well :)) Thanks again for stopping by to read! I'm touched, Steven, not only by your father's artistic input in your life, but your willingness to mentor others. Fantastic! I'm impressed with the care you've taken to detailing your animal illustrations. Beautiful. Thanks for sharing your journey with us! So glad you enjoyed meeting Steven and seeing his art, Jarm!